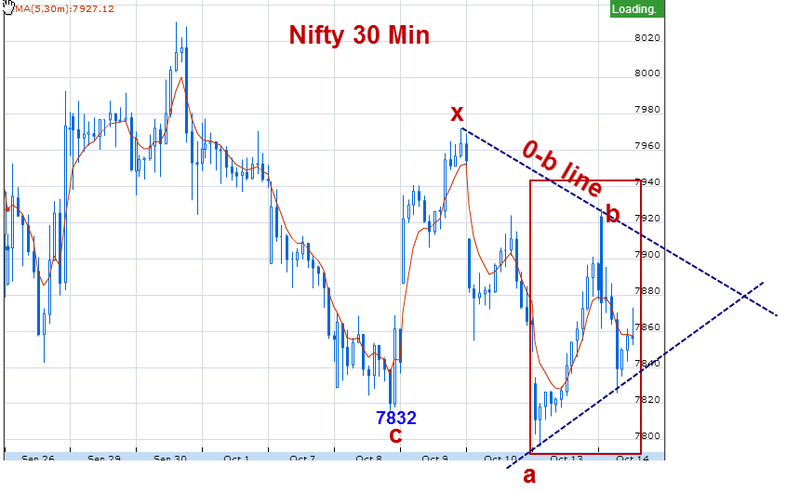 Our friend Pankaj had asked an interesting question.In the 30 min chart above, whether the point marked as 7832 c was not the completion of c, but the point marked as a ( 7797) was the completion of c? 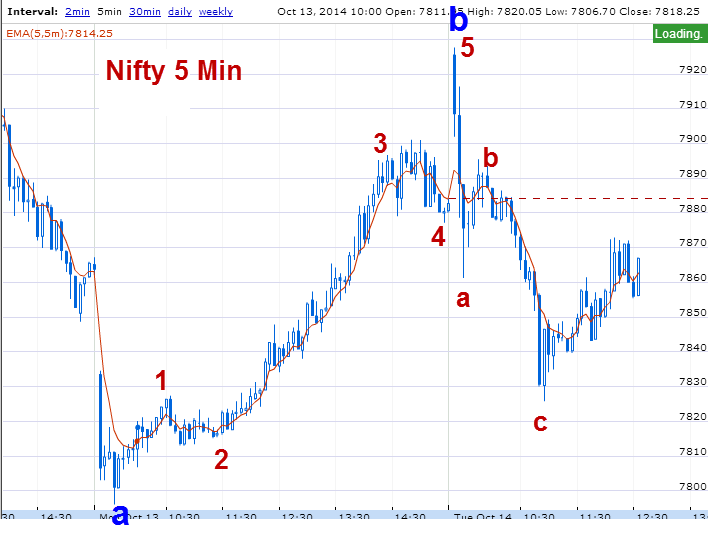 His reasoning is that the wave after 7797 has made a perfect impulse, as shown in the 5 min chart above. 1. I do not expect c to go down below 7797..c need not necessarily do so. For example if c is part of a triangle, then c would be smaller than b, right? 2. The environment is conducive for a triangle and not for an impulse.S&P is down, whereas inflation data and Reliance results favour bullishness. So majority participants are confused and that confusion is prevalent in Nifty movements. 3. Mostly impulse behaviour would be seen when world markets move in tandem..
4. Even by wave counts, if we shift c from 7832 to 7797 point, then degree wise c wave would not match. Any way thanks a lot to Pankaj for this response. These things ae what makes writing this blog worthwhile. exactly i had seen these sub waves. thanks a lot for quick and perfect detailed answer with chart. very good conviction and self less service !